Nicorette Gum works fast to relieve your cravings plus withdrawal symptoms to help you quit smoking. Containing 4 milligrams of nicotine per piece, this gum helps fight the craving to smoke and helps reduce unpleasant withdrawal symptoms. Using Nicorette Gum correctly can double your chances of quitting versus willpower alone. 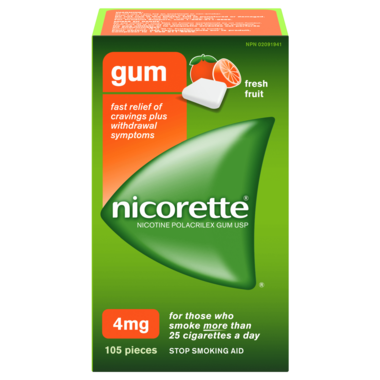 Chew a piece of this Nicorette gum whenever you feel the urge to smoke, up to 20 times a day. This nicotine-based gum is indicated for adults smoking 25 cigarettes or more a day, who want to quit smoking immediately or quit gradually by reducing the amount of cigarettes they smoke each day. Instructions for Use: Nicorette Gum is a medicine that can help you stop smoking by reducing withdrawal symptoms and nicotine cravings. It can be used to quit immediately (Stop to Quit) or to quit gradually (Reduce To Quit) by reducing the number of cigarettes you smoke each day. To increase your chances of quitting, use with a stop smoking support program as identified in the enclosed User Guide. Nicorette Gum can help double your chances of quitting successfully. Although quitting smoking is preferable, Nicorette Gum can also be used as part of a Reduce To Quit program in which it is used to reduce the number of cigarettes smoked prior to quitting in smokers who are not able or ready to quit abruptly. It can also be used in cases in which you temporarily refrain from smoking, for example, in smoke-free areas or in other situations when you wish to avoid smoking. If the amounts of Nicorette Gum you are taking do not help you stop smoking, talk with your healthcare provider about using more than one type of nicotine replacement therapy at the same time. Medicinal Ingredients -- 4 mg of nicotine (as nicotine polacrilex). Non-Medicinal Ingredients -- Acacia, acesulfame potassium, black iron oxide, flavours, gum base, hypromellose, magnesium oxide, menthol, peppermint oil, polysorbate, sodium bicarbonate, sodium carbonate, sucralose, titanium dioxide, wax, xylitol. Warnings: Do not use if you are an occasional or non-smoker. Keep out of reach of children and pets. Do not use if the blister foil is punctured or damaged. Contains natural and synthetic fruit flavours that may cause allergic reactions (Uncommon: oral blisters). DO NOT USE IF YOU: Are under 18 years of age; are pregnant or nursing; have a jaw disorder; have heart arrhythmias; have had a heart attack; have angina pectoris; or are allergic to nicotine or to any of the non-medicinal ingredients in the product. ASK YOUR DOCTOR BEFORE USE IF YOU: Have/have had heart, thyroid, circulation, stomach, liver, kidney, throat or mouth problems, or high blood pressure; take insulin or any prescription medicine.